I got started thinking about constructing polygons in perspective last summer when I was attempting to paint a beach umbrella. I realized that the key to this was to draw the hexagonal perimeter correctly; only with that structure in place would I be able to deal with the stretched fabric, windblown flaps, and off kilter angles in the scene. Most of the instructions I have seen for drawing hexagons and other polygons in perspective require that you first draw the shape in plan view, then use a variety of techniques to project it onto the picture plane. This is accurate but time consuming and becomes more complicated when the object is at an arbitrary angle rather than parallel or perpendicular to the ground plane. I wanted a way to do it "on the fly," that would be more accurate than just eyeballing it but less rigorous than the full-on architectural technique. 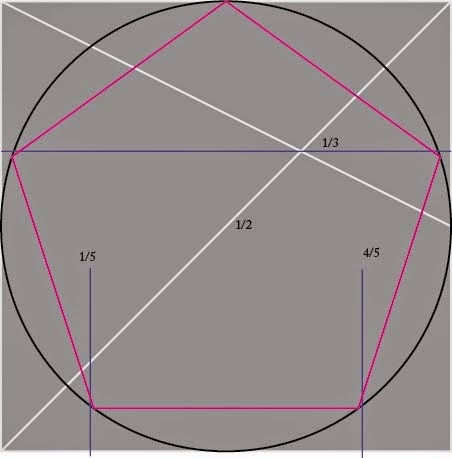 I suspect most sketchers are familiar with the trick for making a circle in perspective, where you start with a square, mark it off with horizontals, verticals and diagonals, and inscribe the circle using these as guides. 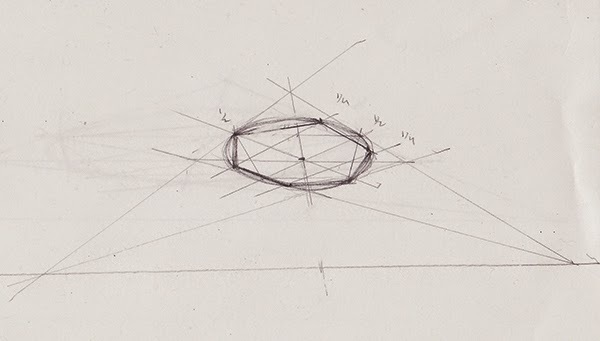 Then, it is relatively easy to draw the square and guides in perspective, and rebuild the circle in the same way. If you would like a refresher, I posted on the topic here, or there are many versions of the tutorial on line. Note that the intersections of the diagonals in the four quadrants locate the 1/4 divisions of the sides. 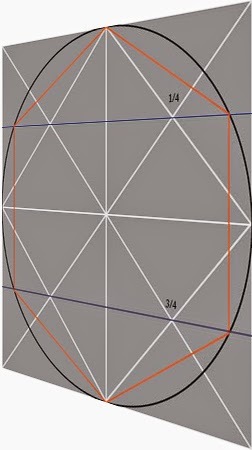 Now, here is the same diagram with the hexagon inscribed and the horizontal 1/4 and 3/4 points extended out to the sides. 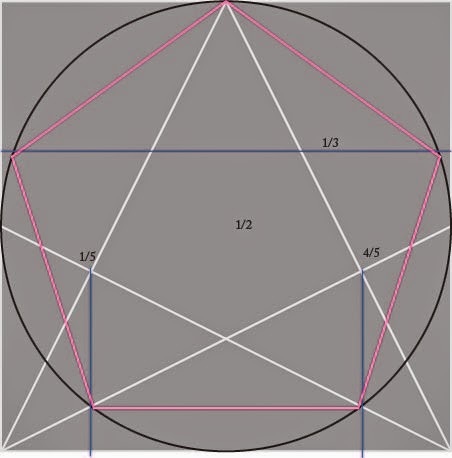 The intersections of the 1/4 and 3/4 lines with the circle locate the 4 middle corners of the hexagon, and the center line locates the top and bottom. With a bit of practice, this procedure can be carried out in a square drawn in perspective. While not as mathematically accurate as a projection from a plan view, it is much quicker and easier to incorporate into a sketch. Here's a real sketch, just to demonstrate that it can be done. I find it helpful to label the half and quarter intersections before drawing the circle and hexagon, to reduce confusion. I also find that having practiced drawing hexagons this way, I am better at drawing them freehand. BTW, although beach umbrellas are usually hexagonal, rain umbrellas are typically octagonal. 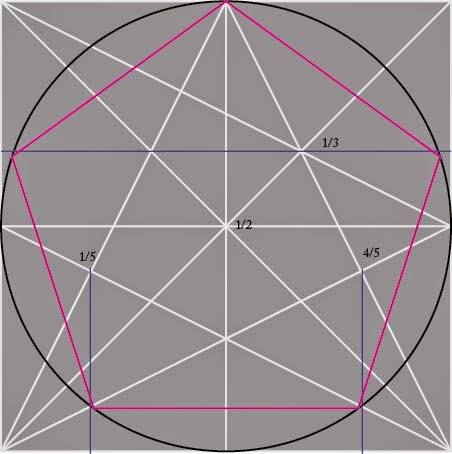 No idea why this is, but octagons are even easier to do with this technique - just draw radius lines from the center through the same 1/4 points, and the circle is divided into eight equal segments. Pentagons, on the other hand, are harder, but doable. However, we have to accept a further level of inaccuracy, as the pentagon does not succumb to ordinary fractions like halves and quarters. 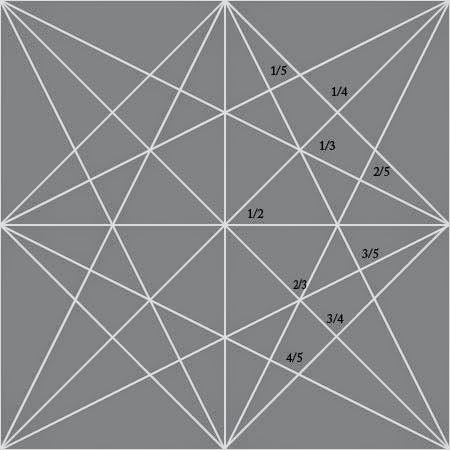 You can see that the vertices of the pentagon almost map on to the intersections of the horizontal line indicating the 1/3 division of the square, and the vertical lines indicating the 1/5 and 4/5 divisions. Not close enough for a mathematician or an engineer, perhaps, but close enough for a sketcher who is making an artistic statement, not a blueprint. So how do we find those points in a way that can be easily applied to a square in perspective? Here we have to go beyond the basic circle trick and invoke the magic of the armature of the rectangle. Those of you who have checked out my Hor:Ratio project will remember this simple diagram with amazing powers of division. 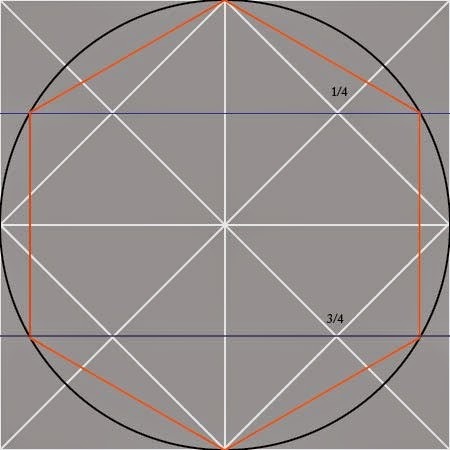 It locates divisions of a square or rectangle by 2,3,4,5, and their multiples using only straight lines added to the basic British flag design we already know from the circle trick. That schmutz in the corner is on my scanner platen, not your computer screen, BTW. 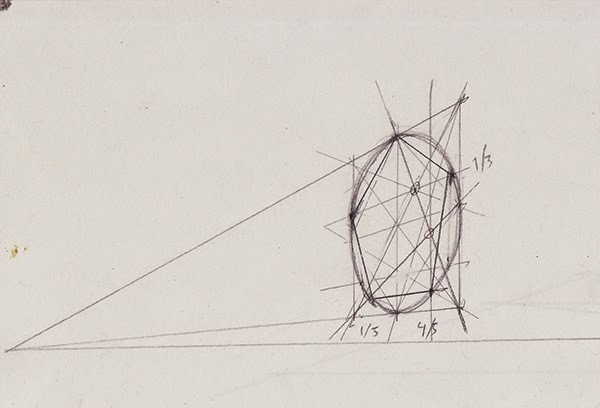 It seems to me that there's a disconnect between the theoretical aspects of linear perspective and its practical application in artwork. I know more than a few very skilled artists who know next to nothing about the intricacies of geometry or even basic arithmetic and yet they can manufacture a drawing that displays a very clear mastery over spatial relationships like foreshortening. I suppose that these artists are performing some sort of mental operation that simplifies these abstract rules and laws into a manageable set of principles that seems to work more effectively than all the theoretical stuff. These artists draw well despite not being able to tell a diagonal vanishing point from hole in the wall. I actually work pretty intuitively, with little recourse to formal perspective most of the time. However, I find that my "eyeballing" abilities are strengthened by having some knowledge of the theory, and sometimes a complex scene really requires some formal underpinnings to work. I also just find the theoretical part interesting in its own right. Besides the technical aspects, there are some interesting historical and cultural issues associated with perspective - how and why did it come to the fore when it did in European history? One theory is that is was needed to express the new value being placed on the individual's subjective experience. Another relates it to a more materialistic world view requiring accurate depictions of concrete objects.